The grounding of the sailing vessel Hawaii Aloha off Hualalai on the Kona Coast on Jan. 3, 2015 caused limited resource damage. This is the determination of a team from the DLNR Division of Aquatic Resources (DAR) that conducted an in-water assessment of the area offshore of the grounding on Jan. 13. The DAR team did find debris scattered on the ocean floor, including relatively small pieces of fiberglass, cloth, eating and cooking utensils, and a few personal items. DLNR will follow-up on the removal of debris discovered during this assessment. Hazardous medical waste was removed by non-DLNR divers shortly after the grounding. The Hawaii Aloha, a 75-foot long, 84-ton, cement vessel was removed from the near-shore bench last weekend. The salvage and debris removal work was conducted by Sea Engineering Inc., under a $150,000 contract from DLNR. The company used a land based excavator to drag the vessel onto the beach, broke it up, and then dumped it into a truck for disposal at the county landfill. 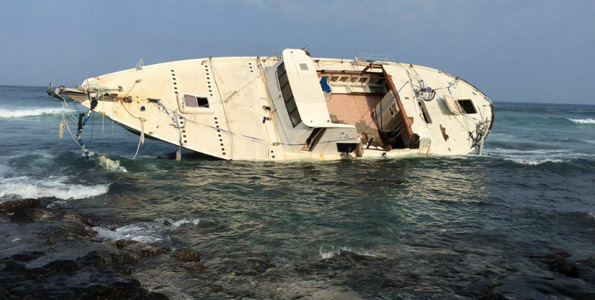 DLNR funded the cost of the salvage, as the insurance covering the Hawaii Aloha did not cover wreck removal. This has prompted DLNR/DOBOR to institute a new policy, requiring vessels using temporary state moorings to show proof of adequate insurance coverage in the event of an accident or grounding. Hawaii Aloha Salvage-Web from Hawaii DLNR on Vimeo.